Shawnee Chief Cornstalk decided to attack Andrew Lewis’s troops at Point Pleasant before they could unite with Dunmore’s army. On October 10, 1774, perhaps the most important battle ever fought in present-day West Virginia occurred at Point Pleasant. It was preceded by a long spring and summer of deadly violence between settlers and Indians. In response to these hostilities, Virginia Governor Lord Dunmore dispatched two armies to attack Shawnee villages in Ohio. Dunmore personally led the northern army, while the southern column was under Colonel Andrew Lewis. Shawnee Chief Cornstalk closely scouted both forces. He decided to attack Lewis’s troops at Point Pleasant before they could unite with Dunmore’s army. During the battle, both sides numbered about 1,000, and the struggle was intense. Much of the fighting involved brutal hand-to-hand combat. Late in the day, Cornstalk misread a flanking movement by the Virginians as a sign of reinforcements. 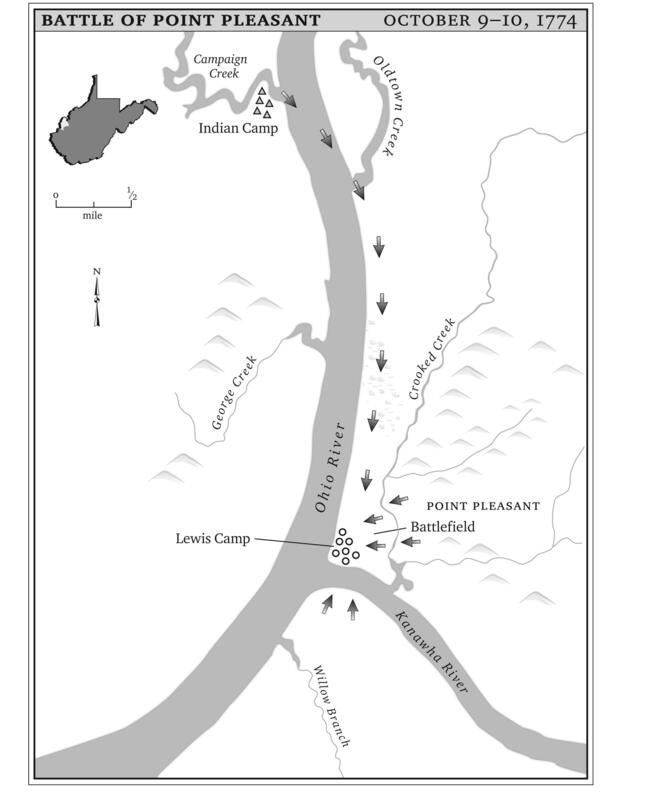 He surrendered the battlefield and retreated across the Ohio River. The resulting treaty, which was signed five months before the Revolutionary War began, brought relative peace to the region. Although the truce proved temporary, it kept American soldiers from fighting a two-front war and allowed them to focus on the British for the first two years of the conflict.